The Kitten Rescue 4th Annual Fur Ball was held at the House of Blues on Sunset Blvd on October 16 and featured live entertainment, a film presentation about Kitten Rescue, a silent auction, and awards for special members of the Kitten Rescue community. Yahoo!’s Daytime in No Time host Nikki Boyer shared how she became involved in animal rescue, helping recover and rehabilitate homeless cats. 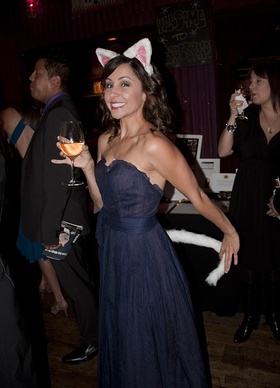 Nikki took her hosting role very seriously, donning kitty ears and a tail! Tricia Helfer also attended. Longtime Kitten Rescue supporter, Fur Ball host and former volunteer Jenna Fischer (“The Office”), who was home with her newborn son Weston Lee, sent a heartfelt text to her friend Nikki as she took the stage to host the event. “Jenna says Hi to everyone and wishes she could be here!” Nikki told the crowd of Kitten Rescue supporters who have come to admire “The Office” actress for her passion for rescuing animals! Guests also enjoyed a vegetarian dinner. Funds raised at the “Fur Ball” go to support Kitten Rescue’s programs and the Kitten Rescue Sanctuary. Find out more here.